Click on montage for closer view. 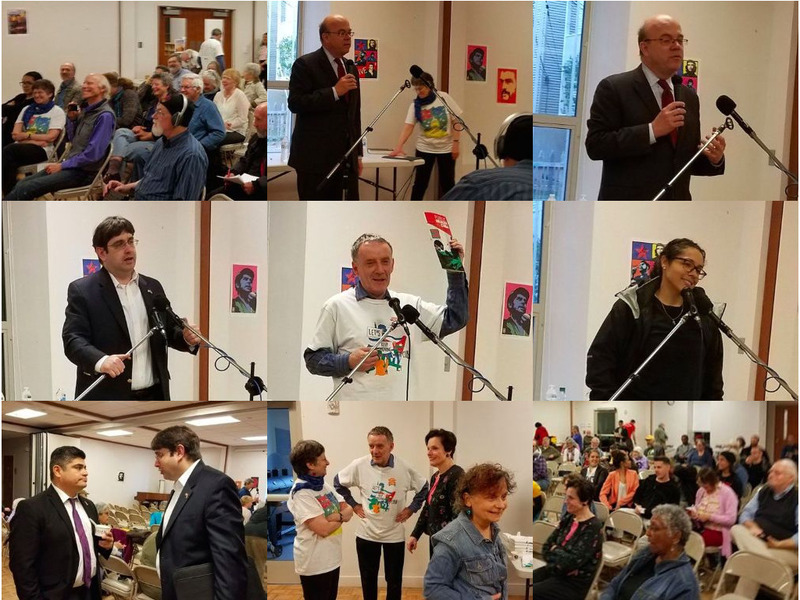 By Monday, April 24, the public event at the First Baptist Church in Jamaica Plain supporting the IFCO/Pastors for Peace Caravan to Cuba had snowballed into a major occasion with four special presenters and attracted 80-90 attendees. Organizer Nancy Kohn sent out the following follow-up afterwards. Miguel Fraga’s portion of the program, recorded by Dave Goodman for IBIS Radio, can be heard here. Thanks so much for coming to Pastors for Peace event. What a great turnout Monday night! Thanks for participating. Jim McGovern shows there are still members of Congress with integrity. Diana Gutierrez could be a stand up comic and at the same time was heartfelt and full of information about ELAM [Medical School]. John Waller, staff person at Pastors for Peace, was analytical and compelling. [First Secretary] Miguel Fraga is the consummate diplomat and almost everyone stayed to the end because it is so rare to get to hear anyone speak from the Cuban Embassy. 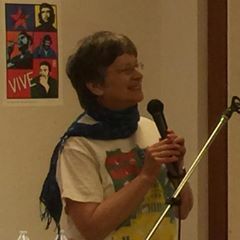 A number of people told me that they hadn’t realized it was in part a fund raiser, so if you didn’t get to donate and feel the urge, here are the links to IFCO/Pastors for Peace and its donation site. Please write something in the box at the bottom of the form so they know you were inspired to give by the event. Together we will end the blockade, lift the travel ban and get Guantanamo Bay returned to the Cuban people.